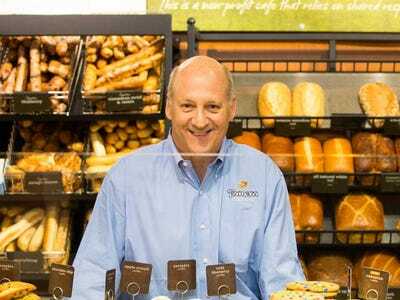 Panera/David ElmesRon Shaich is the founder, CEO, and executive chairman of Panera Bread Co.
Four years ago, Ron Shaich was finally ready to step back. In his three decades as CEO of Panera Bread Co., he’d built a multibillion-dollar restaurant chain with thousands of locations and tens of thousands of employees. It was time for a break. He handed the CEO reins to longtime Panera executive Bill Moreton, and Shaich became executive chairman. Instead of six days a week, he could now spend about three on Panera while he focused on other ventures, like becoming the cofounder of a political movement to fight hyper partisanship in Washington, D.C.
“I knew where all the bodies were buried,” Shaich says, so he decided to take it on. After a year, he realised he was working 60 to 70 hours a week at Panera — far from the reduced advisory role he had previously envisioned. But at this point, he was committed. He stepped back into the CEO role in 2012. Ultimately, the vision Shaich outlined in that memo became the genesis of Panera 2.0, an initiative the company announced earlier this year. It includes several key changes to attract new customers and fend off mounting competition. It’s certainly important for the restaurant chain to stand out from the crowd. Since it competes in every meal category — breakfast, lunch, dinner, and in-between time — it’s up against almost everyone, from fast-food joints like Dunkin’ Doughnuts, Starbucks, and McDonald’s to casual-dining restaurants like TGI Fridays and Applebee’s.